Because artists are busy trying to make a living I’ve offered various ways of responding to my ‘please provide something for your page on the blog’ question. I suggested they might like to provide a short bio or, answer 20 questions, and/or send some photos of; their studio, a place that has a special significance to them in their hometown, some of their previous art work……….Kevin chose to answer 20 or was it the 22 questions I sent him. So without further ado, introducing Kevin Dunkley………. Alway oils. I also now paint on board only. Nostalgia. Memories of travelling our lonely roads in the 50’s and then as a teen, looking for that perfect wave. I’m working on about 6 pieces. I always have quite a few on the go at a time. I’m currently painting very moody skies and golden land. There’s usually a farmhouse to be found. I’m also developing new techniques on my trees – love painting trees. How much of your work, if any, is commissioned? Probably about 2 or 3 a year. I’d love more……..
What was your first exhibition and where? And your most enjoyable exhibition and where? About 8 or 9 years ago [after only about a year painting] I held my first show in a wee bar across the road from where I was freelancing as an art director/designer in a small ad agency. There was hardly any payable work happening so I decided to paint in my down time. Totally naive. Think I sold about 10 out of 50 or so. I think they felt sorry for me! 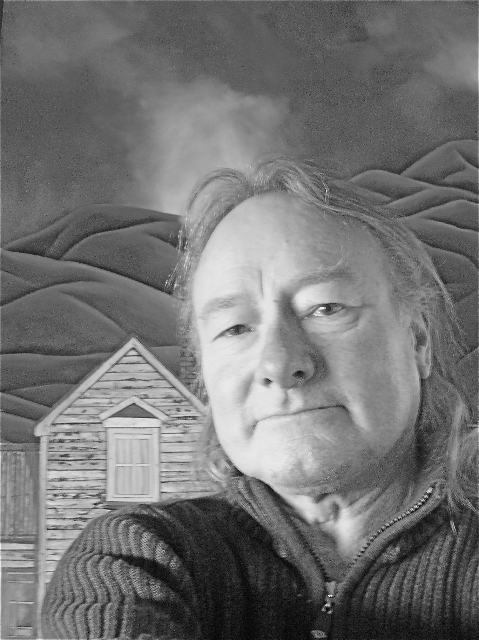 I have only attended openings at Exhibitions Gallery in downtown Wellington. Ron Epskamp the owner has been so good to me in promoting and encouraging me. I go to most openings [once a month] and always enjoy them. The Christmas show is always a hoot as with a dozen artists displaying there’s always heaps of people. Do you ever push yourself to finish something that is arguing with you through the whole creative process? Has the influx of social media changed the way you market your art? I have 2 Facebook sites, one for my art. All my art is shown on Exhibitions website. Dali was my hero. And the Renaissance painters. Locally Michael Smithers earlier works [his rock and pools era]. I also love Jane Kellehan’s abstracts. One day, when I have some money I will do one of her workshops. 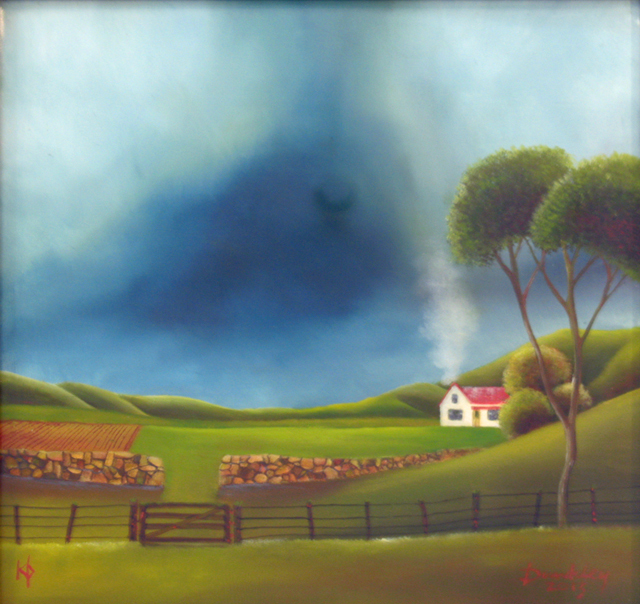 Other artists who show at ‘Exhibitions’ that I totally admire are Peter Hackett, Gail Gauldie, Matt Gauldie, Brian McCracken, Tony Allain Stephen Welch, Susan Webb, Geoff Williams and my fav NZ artist now is Tim Wilson. I don’t really have much contact with artists apart from those who show at Ron’s gallery. 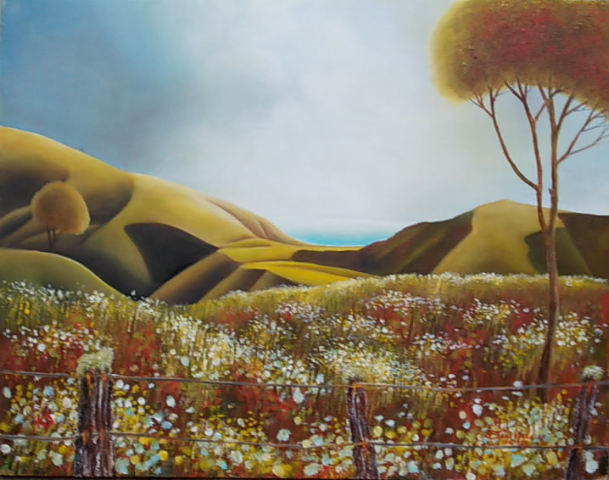 Nearly all my works are pieces of New Zealand, albeit totally made up. The outer islands of Fiji had a big influence too as I love doing hills and mountains. How does place – where you live –influence your work? Yes at my first [naive] show at the local pub. 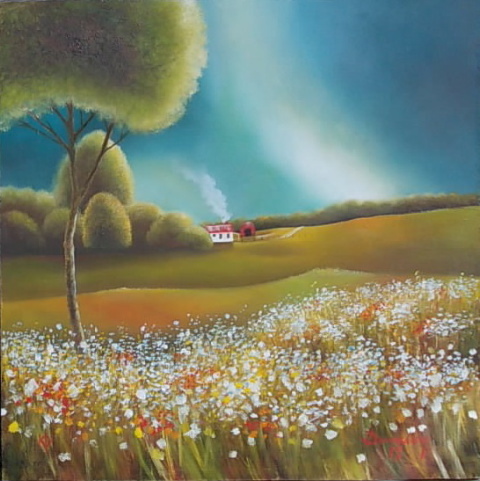 It was called ‘Are we there yet’ – hills, farmhouses, fields. It was the beginning of a great journey. After preparing for an exhibition do you feel like ‘a breather’ or are you brimming with ideas and want to get started on your next project straight away? My mind is always far too active so yes, if I have an idea I’ll put that idea down as my first rough. They usually turn out totally different as I change my mind all the time. I like to put them aside from time to time and reappraise a day or so later. Quite often I see a glaring error that way. Not a lot. I have learned not to have expectations. People [buyers] are fickle. But saying that sometimes I finish one and say it will sell. There’s always one in a bunch that stands out. I paint from home and my couch is my studio. If I’m not listening to Radio Sport or watching something on telly, I always listen to CD’s. The kind of music I play is very inspiring. Do you have a preference for solo over collaborative exhibitions or doesn’t it bother you? Solo is dangerous as the artist pays most of the expenses [opening, invitations, advertising] and with commission, tax, etc on top it can be a risk, especially in these economic times. Three is a good number, though only if all three artists pieces are totally different. I like to get my art out to new people. It’s like going into the unknown, quite exciting. And I found your show idea very interesting, and a challenge. I used to love landscaping but the old body won’t let me these days. I’ve laid about 20,000 old bricks, made stone wall, made ponds and waterfalls. I have a wee Yorkie Terrier called Freddie [after Freddie Truman the great fast bowler from Yorkshire. Cricket is my favourite sport, used to play it]. Most sports really. Also a mad parrot, a huge fish in my pond and a frog called Jeremiah. I have 2 beautiful daughters, 26 and 16 who are amazingly creative. Love cooking and hanging out with good friends over a quiet beer or Riesling. We’ll catch up with Kevin further down the track. I’ve asked his daughters to snap a photo of him but I wouldn’t be surprised if they send a photo of his mad parrot instead! We are so lucky. Apparently it’s molting time for Lou, the mad parrot, so as he’s not looking his best Kevin sent a photo of himself looking his best – please note, my words not Kevins! 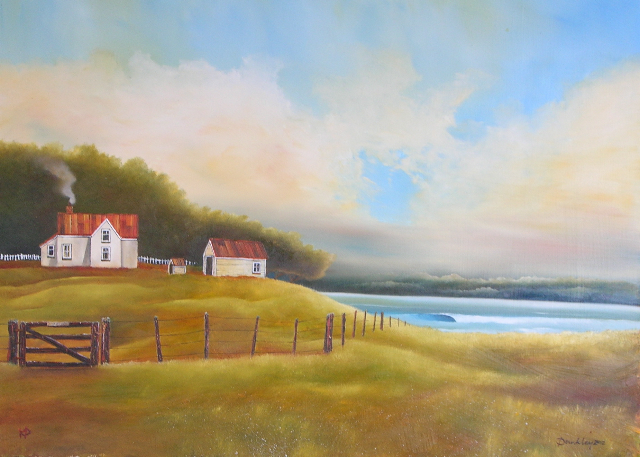 We bought “Are We There Yet” about 8 years ago from a Gallery in Wellington! Makes me smile whenever I look at it! Everyday!! !